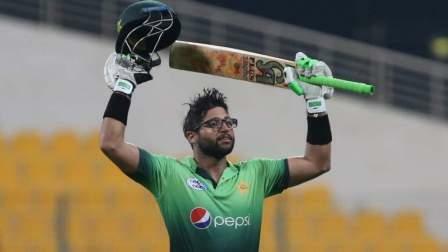 Imam-ul-Haq scored a century on debut and pacer Hasan Ali took five-for as Pakistan clinched the five-match ODI series 3-0 thrashing Sri Lanka by seven wickets at Sheikh Zayed Cricket Stadium on Wednesday. The nephew of legendary Inzamam-ul-Haq became only the 13th player to notch a century on debut. Imam (100 off 125 balls) is also the second Pakistan player to do so after Saleem Elahi, who had scored an unbeaten 102 against Sri Lanka. Imam was twice given lifeline by keeper Niroshan Dickwella on 29 and 89. Meanwhile, Hasan's career best haul (five for 34 runs in 24 matches) placed him joint third with Dennis Lillee on the 'quickest to 50 wickets' list. He also battered Waqar Younis' record to be the quickest Pakistani on the list. The two records ensured Pakistan an upper hand with ball and bat. Electing to bat, Lanka opened well as in-form Upul Tharanga and Niroshan Dickwella got to 50 off 54 balls. Pakistan bowlers pulled things back as Hasan scalped Dickwella for 18 and spinner Shadab Khan ended Dinesh Chandimal laboured stay (19 off 49 balls). With Lankan at 102 for two from 25 overs, onus was on free-flowing Tharanga to push the scoring. However, Shadab ended his valiant innings of 61 runs. A fiery spell of pace bowling saw Hasan bag Chamara Kapugedara (18) and Jeffrey Vandersay (naught), and Junaid pick Milinda Siriwardana (2). Sri Lanka slipped to 141 runs for six wickets in 35 overs. Thisara Perera joined Lahiru Thirimanne but luck played truant for Lankans. Mohammad Hafeez got Thirimanne as the ball took inside edge onto the boot and caught, unintentionally, by the keeper. Next over saw destructive Hasan send Akila Dananjaya back to bag his 50th wicket. Sri Lanka were 163 for eight with seven over left to be bowled. Few lusty blows from Perera drove score past 200. Hasan had his five-for as he got Dushmantha Chameera caught and Perera was run out as Lankans folded in 48.2 overs. In reply, the newest opening pair made a watchful start. Debutant Imam, once settled, took liking to Lahiru Gamage slamming him for back-to-back fours and a towering six. Fakhar Zaman welcomed spinner Akila Dananjaya with a spectacular six. The pair kept the scoreboard ticking with singles and matched Lankan score of 53 after 10 overs. Sri Lanka then suffered setbacks as Imam was dropped by keeper Niroshan Dickwella on 29. Chamara Kapugedera went out with a swell below the eye as Dickwella's lob hit him. Amid a sleepy phase of play, Imam was engaged in a good contest against spinner Dananjaya and pacer Dushmantha Chameera. Another spinner Vandersay was introduced and it worked. Fakhar was undone by Vandersay's googly ending 78-run partnership. Imam wrested the advantage with another six and soon got to his 50 from 67 balls. Spinner Milinda Siriwardana was operated but Imam and Babar Azam calmly handled the situation. Gamage got the breakthrough getting Babar for 30 and ending the 66-run partnership. However, an experienced Mohammad Hafeez (34) ensured no further damage. When at 89, Imam was given caught behind but TV replays showed Dickwella had grounded the ball. Imam went on to reach his century and when he was out Pakistan needed just six runs to win the series.